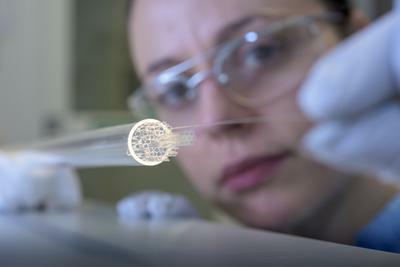 The University of Southampton’s world-leading expertise in photonics and fibre optic technology has been awarded a prestigious Queen's Anniversary Prize for Higher and Further Education. The Queen's Anniversary Prizes are the UK's most prestigious form of recognition for a UK academic or vocational institution, with approval directly from The Queen and Parliament. A delegation from the University will travel to Buckingham Palace in February to formally receive the prize. This year’s Queen’s Anniversary Prize for Southampton recognises the many decades of inspired innovation by the University’s Optoelectronics Research Centre (ORC), a vibrant community of over 200 staff and postgraduate students working on cutting-edge research in photonics – the science and technology of light – to provide solutions for real-life problems. The work of the ORC – the largest and longest established centre of its kind in the UK - has led to breakthroughs in optical fibres, laser manufacturing, next generation computing and new optical materials that power the internet, feed mobile telephone networks and help make life-saving devices that transform our daily lives. As well as its extensive links with companies and universities around the world, the Centre – which leads a new national manufacturing hub for the UK – has also been responsible for developing a major research and commercial nucleus within Southampton and the surrounding area with at least 10 companies ‘spinning out’ to provide employment and inward investment to the region from its work. The Centre's global reach includes its partnership with Nanyang Technological University which has led to the establishment of The Photonics Institute, making Singapore a new powerhouse in photonics. The ORC is also renowned for its wide range of outreach activities with schools and colleges, delivering activities designed to encourage more students to study physics and support the teaching of photonics in schools whilst engaging them in research and the wider promotion of careers within physics and engineering. Activities including the Photonics Explorer workshop and The Light Express Roadshow reach thousands of school-age pupils and students each year. Sir David, who was knighted in 2013 for his work in photonics research and applications development, explained the legacy of the ORC. “Over fifty years ago the ORC received global recognition for developing one of the world’s first ultra-low loss optical fibres. From there we were the first to announce another vital component that allows the internet to span the world, the optical fibre amplifier that periodically boosts the signals. Today hundreds of millions of kilometres of optical fibre carry the signals on the internet. Sir David is now keen for his colleagues to continue pushing back the boundaries of research and commercial application using materials not conceived when the ORC was first founded. “Despite 50 years of research, photonics today is still in its infancy,” Sir David adds. “Much like the early days of electronic computing, photonics is not yet integrated, and data to our homes is still serviced largely along copper wire. This award marks the third time the University of Southampton has received recognition via the Queen’s Anniversary Prizes. In 2011, Southampton was honoured for its Performance Sports Engineering Laboratory supporting high-performance sports competitors, including several Olympic Gold Medal winners such as track cyclist Sir Chris Hoy and skeleton athlete Amy Williams. In 2005, Southampton’s Institute for Sound and Vibration Research received the award for its many contributions to business and the wider community including efforts to make aircraft quieter, improving the efficiency of cochlear implants for people with hearing loss, improving sound systems and understanding the mechanisms of bubble acoustics.